You may have noticed by now? That I'm keen on supporting new titles published by British authors this year? :) I am. 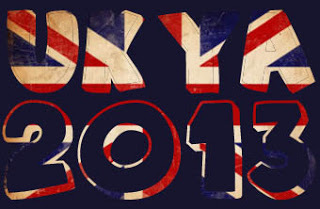 My UKYA in 2013 feature is one of my favourite posts to write and I love the quality of books that I've been reading and reviewing this year and I love how many UKYA authors have taken the time to write guest posts or be interviewed here on my blog. Let's hope this continues for the rest of the year. BUT! I was sitting here thinking there must be another way to go about rousing some enthusiasm for these brilliant UKYA books that I've been reading lately? And really, the only thing I could come up with, and I hope you'll agree that it's a good idea, is a giveaway! So here are a selection of books that I have available for you to win. All are in excellent condition, most have been read (apart from some duplicates) and I've tried to list as much information as I can below. What I'll do is I'll make this a regular thing throughout the year and continually add more UKYA in 2013 titles to the giveaway pile and every now and again, I'll write a quick post and set the giveaway ball rolling again. I think this is a really great idea, shamefully I've only read one of these! And some I didn't even know were Uk pub like The Disappeared and By Any Other Name. I'm most excited for the Bunker Diary though! What a lovely crop of books. Great idea to have a giveaway! Thank you for the opportunity to win, I feel like I should make more of an effort to read UKYA! That's an amazing collection of great YA fiction. Ooh. Pick me. Pretty please. + genius idea, that there. most giveaways are US only, I'm so glad you did the opposite! What an amazing giveaway, thank you so much! Please pick me! Most of these are on my wishlist and I definitely want to read more British YA authors. I love British books and the ones you have chosen are fantastic. I hope I win, hehe. Thanks for the giveaway, Clover! What an awesome giveaway, I'd love to be considered. tinylibraryblog (at) gmail (dot) com. Thanks for the giveaway, such a cool idea, I'm always on the lookout for new UKYA. Geek Girl was awesome! I'm always happy to help UK authors! Please pick me!I'm really intrigued by 'The Last Minute'and I thought 'The Bunker Diary'was absolutely brilliant. Pick me, please! I feel like this is an opportunity too great to pass up...thanks for the giveaway, haha! OHMIGOSH, PICK ME PICK ME!!!!!! These books all look awesome and I really need to read more UKYA - finished reading Undone recently and it was amazing! Ah, there's so many of my 'I WANT TO READ THIS SO BAD BUT CAN'T FIND IT ANYWHERE' here. Thank you so much for the giveaway, Clover! How have I not already entered this! What an awesome looking giveaway! Good luck to everyone! This is such a great giveaway! I can't resist entering despite my huge TBR...pick me! Wow, this is such an impressive giveaway! Keeping my fingers crossed I get picked. Amazing giveaway! I never win anything but crossing my fingers anyway!